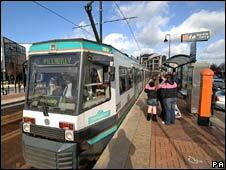 Greater Manchester's tram network is to undergo another extension as part of a £1.5bn transport improvement scheme. Metrolink will be extended to East Didsbury, Manchester Airport, Ashton-under-Lyne, and the town centres of Oldham and Rochdale under the scheme. The expansion was initially tied to the proposed congestion charge but went on hold when it was rejected in December. The Association of Greater Manchester Authorities (AGMA) is meeting most of the cost from existing budgets. Howard Sykes, Liberal Democrat leader of Oldham Council, said it would transform the areas. "In terms of economic development and prosperity this will act as a catalyst, creating new jobs and delivering essential infrastructure that will put Oldham on the map." Money will also be spent on the Mottram bypass, additional busways, a Manchester park and ride scheme and bus station improvements in Bolton and Altrincham. Government is providing £195m towards the scheme, with the remainder being found from existing AGMA budgets. Transport Secretary Geoff Hoon said he was grateful to the work of local leaders in developing the plans. "I welcome these proposals to bring forward £195m of government funding to improve local transport in Greater Manchester," said Mr Hoon. "The Ashton and East Didsbury tram extensions, bus improvements around Oxford Road and park-and-ride schemes will make a real difference to the residents and economy of this great city." The new Metrolink line is set to have six stops in Oldham, including the town centre, and will also extend to Rochdale town centre. Another line will be extended south of the city to Didsbury, which John Leech, Liberal Democrat MP for Withington, hailed as "great news". "This is what we have been asking for ever since the results of the referendum when the congestion charge was thrown out," said Mr Leech. "For a long time the government was saying there was no plan B, there was not going to be any money available to Manchester, and obviously this is a big issue we have been campaigning on ever since." The Metrolink tram system was launched 17 years ago, connecting Altrincham in the south with Bury in the north via Manchester city centre. The transport secretary was unveiling the full transport expansion plans at a meeting in Manchester on Wednesday. AGMA board member Susan Williams, a Conservative councillor in Trafford, said it was the culmination of hard work by politicians in the region. "It's nice of Geoff Hoon to announce it but it has been expedited by the 10 local authorities," said Ms Williams. "We always said we had a plan B. This is plan B and we've made it happen with no money from government."